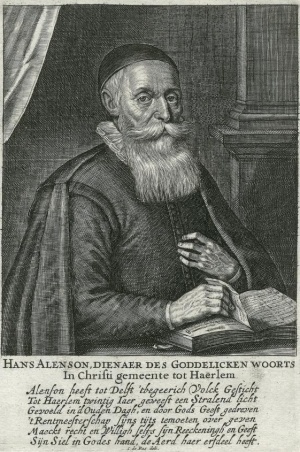 Hans Arentsz Alenson was a Dutch Mennonite preacher. He was born at Hondschoote in Flanders, fled to Holland, lived at Leiden, Amsterdam (after about 1591), Leeuwarden (after 1598), Delft (about 1615), and Haarlem (after about 1625), and died at an advanced age in April or May 1644 at Haarlem. At first he belonged to the Flemish Mennonites, but after being banned he joined the Waterlander group. By trade he was at first a grocer and afterwards a weaver. The hypothesis of some art experts, Hofstede de Groot and Valentiner among others, that the two portraits in the Penrhyn Collection in England, painted by Rembrandt in 1634, represent Hans Alenson and his wife, has proved to be false. The pictures in question are those of the English clergyman John Ellison of Norwich and his wife. Alenson is known only as the author of the very important Tegen-Bericht op den voorreden van't groote Martelaer-Boeck der Doopsgezinde, which was published at Haarlem in 1630 from the press of Jan Pietersz Does. The booklet was reprinted in Bibliotheca Reformatoria Neerlandica VII (1910, 139-266). The purpose of the Tegen-Bericht is to show (1) that Hans de Ries and the other liberal Waterlander and Flemish compilers of the first edition of the groote martelaarsboek had not, as the strictly orthodox Frisian publishers of the third edition of 1626 had charged, falsified the martyrs' confessions and omitted part of the Melchior Hoffman doctrine of the incarnation; and (2) that Menno and his contemporaries had in many points been more liberal than the unbending Frisians claimed in what they proclaimed in 1626 to be the true teachings of Menno Simons. The value of the booklet lies in all the information which Alenson gives from his personal acquaintance and conversation with several friends of Menno who had outlived him, as well as with various martyrs. Cramer, Samuel and Fredrik Pijper. Bibliotheca Reformatoria Neerlandica, 10 vols. The Hague: M. Nijhoff, 1903-1914. Vols. 1-6 available in full electronic text at http://www.archive.org/search.php?query=Bibliotheca%20Reformatoria%20Neerlandica: v. VII: 139-266. Wijnman, H. F. Jaarboek Amstelodamum (1931): 81 ff. Cramer, Samuel and Nanne van der Zijpp. "Alenson, Hans Arentsz (d. 1644)." Global Anabaptist Mennonite Encyclopedia Online. 1955. Web. 25 Apr 2019. http://gameo.org/index.php?title=Alenson,_Hans_Arentsz_(d._1644)&oldid=132382. Cramer, Samuel and Nanne van der Zijpp. (1955). Alenson, Hans Arentsz (d. 1644). Global Anabaptist Mennonite Encyclopedia Online. Retrieved 25 April 2019, from http://gameo.org/index.php?title=Alenson,_Hans_Arentsz_(d._1644)&oldid=132382. This page was last modified on 20 July 2015, at 18:54.